Here’s a chance to get a bit creative with scraps of paper – use three small squares to top an elegant ribbon bookmark. Cut an 8 inch piece of ribbon. Cut another if you intend to layer two ribbons as we have done in the photo. You can use any width of ribbon you like for this project but you will need to place the widest ribbon on the bottom of the bookmark. 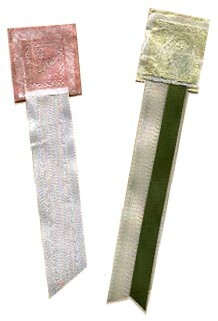 I used textured rice paper for this bookmark. Cut a square a little larger than your ribbon (refer to photo) with either specially scissors (I used deckle cut) or tear the edges as evenly as possible. Straight cut edges are not as attractive for this project. Cut another square, slightly smaller and another square slightly smaller than the last. My rice paper was a solid white and to add colour, I simply diluted a pink and green coloured paint with water (two parts water to one part paint) and painted the paper, making sure it was completely saturated and not being very careful to keep the colour even (I wanted an aged worn effect). I only coloured two pieces and left the medium size square in plain white. Allow the paper to dry completely before continuing. With dimensional paint, paint a small outline around the small white paper. Simply add irregular lines and dots. Set aside and allow the paint to dry completely. Take the largest square of paper and place the solid ribbon on top (refer to photo for paper and ribbon placement). Glue in place. Glue the second ribbon directly on top of the solid ribbon [if using two different ribbons], lining both ends up with each other. Take the second largest square and place it on top of the two ribbons, lining up your paper with the larger square. Glue the painted piece of paper to the top, once again lining up the edges. Allow the glue to dry completely and trim the bottom ends of ribbon on an angle.